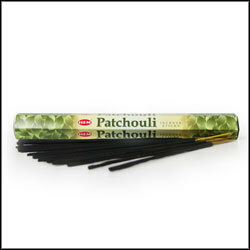 HEM Patchouli 20 x 9 inch hand rolled incense stick hex pack. Patchouli is one of the most common incense fragrances, delivering a fragrance which resembles the essential oil of the Patchouli plant. Patchouli provides a naturally sweet fragrance filled with green notes and hidden floral scents.